Let me start off by saying, I loved Brave, but I won’t start with the review of it just yet (Sorry for the somewhat misleading title). Instead, I’d like to take a moment to talk about the short animated film that preludes the main feature that has become the staple of Pixar films. People get as excited about seeing what Pixar can do in 5 minutes as they get about whatever hour-and-a-half film they’re about to watch. La Luna, the short preceding Brave, is no exception. It’s such a delightful and adorable short that you almost forget what you came to see in the first place. I hesitate to say that the 5-minutes were worth the price of admission alone if only because of the extortionate prices cinemas charge nowadays. Oscar-nominated La Luna shows us the story of three-generations of lunar-janitors; a grandfather, a father and the young son. The shorts are characteristically speechless but we understand that it’s the young lad’s first time out working with the family business. Pixar understand how people work and communicate and all of the small nuances that are needed to make a convincing animation. In my opinion, this blows every other short out of the water. The grandfather and the father, coming from different generations, both have their own ideas about how things should be done and try to get the boy to do as they do, fighting for possession of the next generation. Luckily Pixar deal with the struggle in a delicate, yet humorous way. It’s an amusing and sweet insight into family life and the resolution will no-doubt leave you smiling whether you want to or not. The animation is beautifully rendered, with hand-painted watercolours imbuing the whole short with a gorgeous mix of browns, blues and oranges to create a spectacular thing to watch. 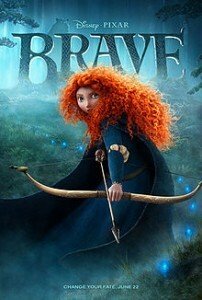 Brave is similarly colourful, except it’s the greens of the Scottish highlands that pervade the film. The stark contrast comes from Merida’s flowing red locks. The hair in Brave is a triumph of animation and something Pixar was incredibly proud of in the build-up to the film release. It’s easy to see why. Most people will appreciate how great the film looks but animation aficionados will be astounded by how detailed the hair in this picture can be, all set against a backdrop of forests and wildlife as alive as it could possibly be. The story itself is the standard ‘be careful what you wish for’ plotline mixed in with rebellious youth, overbearing parents and the weight of responsibility. We’ve seen these stories told countless times through every medium going. Somehow, as usual, Pixar manages to make it feel fresh and exciting. You get drawn into the world of the ancient Scots and Merida’s life. Pixar aim to show you both sides of the story so that the audience has sympathy for Merida, but can also understand her mother’s point of view, and Pixar hit the target dead centre. When you aren’t marvelling at the stunning set pieces or paying attention to the well-paced and engaging storyline, you’ll be laughing out loud. Humour is a huge part of every Pixar film and it’s always well-timed, witty and (most of the time) just a little bit silly. Brave is no exception. From sharp one-liners and Billy Connolly’s bumbling king to an indecipherable young suitor that leaves everyone looking blank, you’ll be hard pressed not to be chuckling along with everybody else in the cinema. Brave is certainly worth the time to go and see and is the perfect film for a cheerful and light outing to the cinema. It’s worth the admission price too. Even where tickets are most expensive, I urge you to go and see it on the big screen. Pirate copies (while not just illegal and morally wrong) would never be able to capture the painstaking effort Pixar have put into every detail of the animation and would never be able to recreate the same feeling of being surrounded by a hundred strangers joined together by the enjoyment of a brilliant piece of cinema. Pixar films are only once every couple of years, but they’re worth every damn second spent waiting for the next.